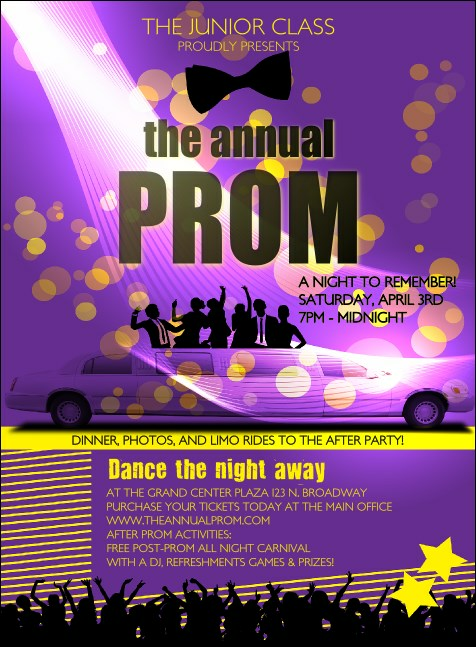 Celebrate one of the most memorable nights in a young person's life and make your organization’s event planning efforts easier with this Prom Limo Invitation and matching event kit. The gorgeous purple background highlights the silhouettes of dancing teens popping out of a limo. Add fifteen lines of text to the template below and we'll send your invitations your way! Approximate size: 5.63" x 4.14"
Event planning is easier than ever before with TicketPrinting.com!